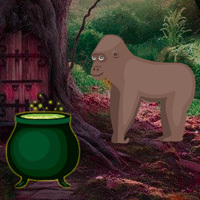 BigEscapeGames - Big Magical Forest Escape is an point and click escape game developed by Big Escape Games.A big escape game with tough puzzles. In this game, you came to see the beauty of a magical forest. But unfortunately, you missed the way out from this place. You have to find the way to escape from there by finding useful objects, hints and solving puzzle. Click on the objects to interact with them and solve puzzles. Good Luck Have Fun! Hi dazz. joining you now. where does the bird go? stuck in second set. the connect the dot puzzle does not work with the clue given. Can anyone help? Hi Val, I can't find a spot for the bird either. I finally got it Dazz, my clue was wrong. I watched the walkthrough. Thanks, Dazz, for the sneaky by the book! That's all I needed to finish up. Orange/Yellow birds are used in last set, Val & Jenny. PLEASE take ads off right side of page, every single game refreshes when using right Nav arrow, it’s frustrating, even though I like these games! Hi, I'm a first time commenter here; I have been playing the games for a few months. I have almost completed the second set of scenes. I am hung up at one last puzzle, this is the multi-coloured cross one sees immediately on entering the first scene of the second group. I can't seem to find anything that could be a clue for this puzzle. HELP!!!! Thanx in advance.